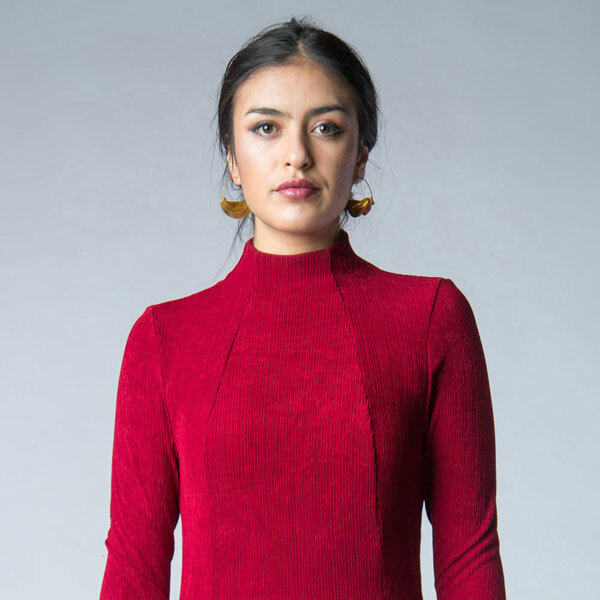 An elegant, easy-to-wear knit dress that slips perfectly from day into night. This style is designed to be easy and quick to make without fussy closures. It features a built up neckline and shapely, figure flattering seams that lengthen and emphasize your curves. It is fitted at the waist with a full, flowing skirt. Jackie is an elegant, easy-to-wear, super comfortable knit dress that slips perfectly from day into night. This style is designed to be easy and quick to make without fussy closures. It features a built up neckline and shapely, figure-flattering seams that lengthen and emphasize your curves. 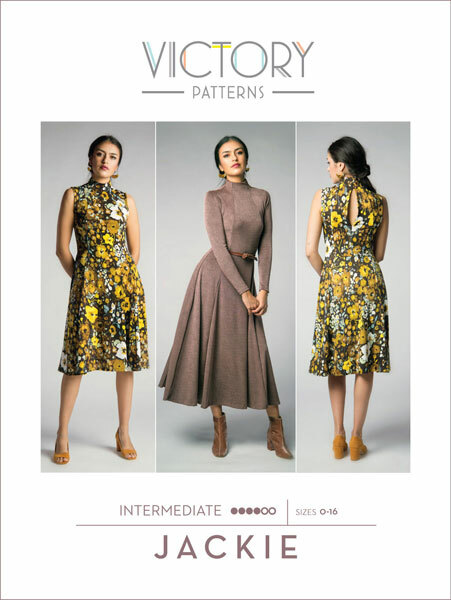 It is fitted at the waist with a full, flowing skirt. 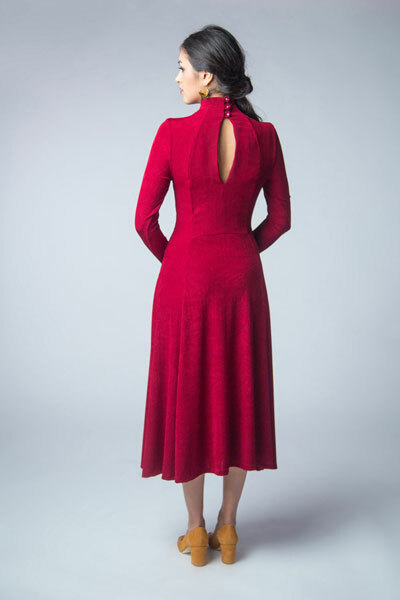 A subtle opening at the back upper bodice closes at the neckline with three small buttons and rouleau loop closures. This project uses both a serger and sewing machine. You can also make it with just a sewing machine. Version 1: Long sleeves with hemline ending just below mid calf, approximately 32.5" (82.5 cm) down from the natural waist. Light to mid-weight two-way stretch knit fabric with moderate to high drape. At least 20% stretch. Various knits: Jersey, bamboo, cotton, modal, silk, velour, ponte, scuba. 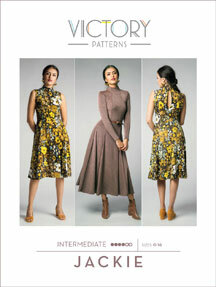 See the last image above for detailed fabric requirements. See the last image above for finished measurements. 0 32" 23 1/2" 34"
2 33" 24 1/2" 35"
4 34" 25 1/2" 36"
6 35 1/2" 27" 37 1/2"
8 37" 28 1/2" 39"